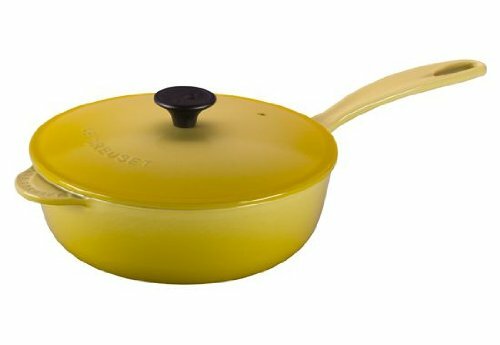 Modeled after the smooth, curved contours of the Soup Pot and Bouillabaisse Pot, this classic saucier pan by Le Creuset offers the steady heat distribution of cast iron and the seamless cooking surface required for building and stirring delicate sauces. The pan's wide, shallow shape facilitates easy stirring, while its gently flared sides encourage rapid reduction, concentrating flavors. The saucier holds up to 2-1/4 quarts and measures 16-1/2 by 8-4/5 by 5 Inch.